September 23, 2018 3 comments on "Full Lectern Job"
As far as I can tell, the lectern was an innovation of David Cameron’s – although Tony Blair from time to time spoke from one, there wasn’t an official, capital-L Lectern with the Government coat of arms on it and nobody ascribed any political significance to it. I have the impression that the lectern got promoted because Cameron started holding monthly broadcast press conferences where he stood behind it to take questions from journalists. Cameron was of course imitating the Americans, whose government agencies all have an official lectern with their particular style, from the White House down to the Department of Housing and Urban Development. But there is something more interesting here than just yet another The West Wing homage. 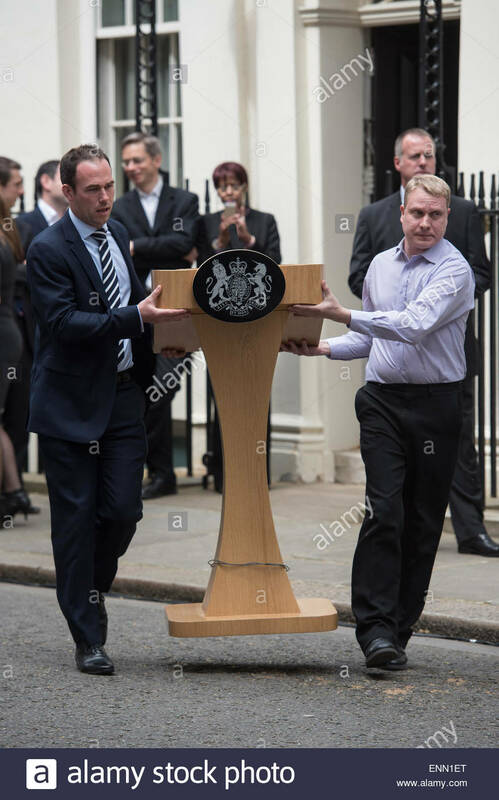 Thinking about May’s frequent Full Lectern Jobs, it strikes me that the style of political presentation has gone through maybe three major changes in my lifetime. To begin with, you have the classical era. This was when iconic legends like Alistair Campbell or Charlie Whelan defined the nature of the art, creating timeless repertoire and standard technical conventions. Of course, we can argue about how far back it goes – obviously something like that was what Bernard Ingham did, but what about Gerald Kaufman, Joe Haines, or Philip De Zuelueta? One of the most important principles that came down to us from the masters of the classical era was that the supreme artifice is the appearance of naturalness. The propagandist should ideally disappear in their own performance and must never become the story themselves, in Campbell’s own words. But it was precisely this that was put back in question by the revolutionary changes post-2010. In the modern era after 2010, those around David Cameron adopted a new approach that abolished the complex storytelling and extensive mise en scéne that characterised the classical era. These were now seen as irrelevant, fake, and in any case, dated. Instead the aim was now to exhibit the purity of perfect technique in abstraction, a Balanchine aesthetic applied to spin. You did not go on the Daily Politics to communicate any message but rather to perform politicianing, to impress the critical audience with the way that it was done, the how rather than the why or what. The painting was, as the New Criticism had asserted, first of all paint. What was it about? About thirty minutes, at the despatch box, ninety seconds on the 10 o’clock news, a half hour shitstorm on the Internet. Hence the lectern, a tool for the abstract execution of politicianing. But even this had its day. By the end of the Cameron years, even the master himself seemed to tire of his own ice-cold minimalism. The public seemed to crave more performance, more story, an element of kitsch. This brings us to the May revolution and the current moment. This steps beyond just the abstraction of technique to a sort of deliberately overdone, postmodernist overstatement, like a neon-lit Corinthian pediment in styrofoam hanging at a silly angle over a casino’s front door. It is not enough to do a cynically vacuous tough leadership moment – it is necessary to go meta and perform yourself performing politics, one definition of a camp aesthetic. Look at me – me! – doing a politics! All the classic tropes are there, as purified through the modern era, but pushed to a caricatural level of excess, deliberately scrutable and hyper-obvious. You don’t just put up a lectern to show that a political event is happening, you announce in advance that there will be a lectern and as a result, an event is held to have happened. Hell, I’m even blogging about it. In the Cameron aesthetic we could almost have skipped actually giving the speech from the lectern, however, this would now look passé. But where are we going from here? We have changed the performer and the performance. We have changed the emphasis from addressing the audience to addressing the critics, a crucial element in the transition from folk art to high culture. Maybe it is time to deconstruct the whole thing. 3 Comments on "Full Lectern Job"
The Twitter feed? On one level, it’s the same activity as @SirGammon58229014 or @MagaCatUS17, on another level it sets off the entire press pack (and a few tiers of the bureaucracy). What marks it as political or governmental speech, however illocutionary its content might be, is its ability to generate a response. Skinnerian. That said, Aló Presidente was ahead of its time. Could it have been as simple as to discourage the bizarre manspreading epidemic of 2015? May at her lectern somehow reminds me of Alan Bennet’s BtF sermon.